Thank you for checking out our website! 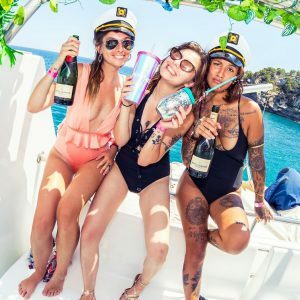 You can rest assured that this is Ibiza’s craziest boat party but we understand there are some things that you must know before deciding to ride with us. Please make sure to check out each section, if you still have doubts you can let us know via our Contact page. We recommend you to book your tickets online! Since we are the original source of the tickets you can be sure that you're getting the latest and best prices for our products. Plus, being one of the leading boat parties in the industry, chances are that 90% or more of our tickets might be sold out by the time you arrive to the island. Depending on the month (January and February we don't offer discounts), you can receive a super group discount and it's automatically done through our system. If you are a group of 6 or more, just go to the calendar and select the date you want to come to our boat. Select the number of guests (more than 6) and the system will already give you your discounted price! If you need to organize the craziest HEN or STAG party, we listen to your all your wishes and requests! Write us to ticket@oceanbeat.es and tell us about the extras that you'd want to add to your standard ticket, details about your party fellows, date and how can we support so we can take care of it before you arrive and make it unforgettable. Trust us, this is the proper Ibiza way! The Oceanbeat Ibiza boat party departs at Oceanbeat Pier: Carrer de la Punta, 2, 07800 Eivissa, Illes Balears, Spain. The check-in for the boat party begins at 12.30 pm at Bar Forever, just in front of the Oceanbeat Pier. The Party starts at 13.30 and lasts until 17.30. After the boat party you have the opportunity to join the official after show party at Bora Bora. During our crazy ride we cruise along the famous coast of Playa d'en Bossa and some of the most beautiful bays of Ibiza. We of course have a swim stop! At around half of our trip you be able to jump into the turquoise waters of the Mediterranean and refresh yourself! 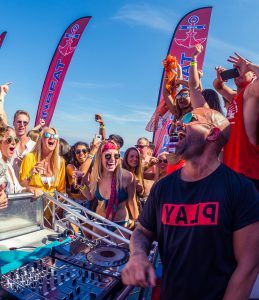 Each Oceanbeat boat features a wide array of well-known international DJs on the decks spinning the hottest dance records to keep you moving on the dance floor the whole ride long! We'll make sure you don't suffer when it comes to alcohol. During 4 hours (4 HOURS!) we offer a cold Spanish San Miguel beer and traditional Don Simon sangria , soft drinks, plus some special drinks like Slush Puppies, mojitos and the world-reknown "Meluna" giant watermelon! The Oceanbeat Club Pre-Party is a 3-hour, non-stop, all-inclusive open bar with longdrinks, beer, sangria, soft-drinks and a fresh selection of cocktails! In general all our Club Pre-Parties are held in Playa den Bossa, except of Sundays and Pre-Season where the location is RIO in San Antonio. To confirm where the Club Pre-Party of certain day is please write us an email to ticket@oceanbeat.es or call the following free number 0034/900 834 932. Our Club Pre-Party starts at 21:00 and ends at midnight. If you are in San Antonio or outside Ibiza town, we offer you transport to our Oceanbeat Ibiza Pier, which you can add to your booking for an additional 5€. Please contact us beforehand and ask about availability on the day you're planning on joining us. You can reach some of the partner clubs by foot, other clubs via local transportation. Most of the clubs can be reached via free disco buses. Generally there is a one Superclub ticket included in your Oceanbeat Ibiza Club Pre-Party Ticket and up to 3 superclub entries included in your Oceanbeat Ibiza Boat Party Ticket (depending on availability). Please bear in mind that we cannot promise high selection of clubs during pre-season or off-season as many clubs are closed during these times! Depending on the party package that you decided to go with, we offer some club entries included in your ticket. These clubs are: Sankeys, Eden, Privilege, Es Paradis, Swag or Ocean Beach. Your VIP Ticket comes with priority boarding on the boat, access to exclusive VIP area with security control, your own private VIP hostess, the ability to bring 2 guests from the crowd to your table AND MUCH MORE! Check out the VIP ticket options on our website for the full description. Not for the average joe! 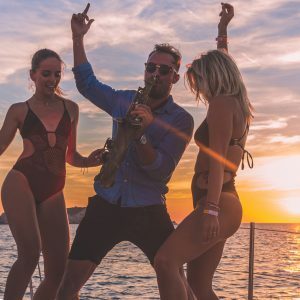 Include some extra goodies that'll make sure to show how you like living your life, like private limousine transport to and from the boat party! Make sure to coordinate with us before you arrive to the island so we can treat you like you deserve! The Oceanbeat boat party is equipped with all necessary safety standards according to Spanish law. A life raft, lifesavers as well as trained staff are on board. (in accordance with the safety standards of the boat company). The Oceanbeat Pre-Parties take place in partner bars, all of them are equipped with safety standards according to Spanish law. We serve delicious selection of fresh fruit as well as small muffins. However you can buy some snacks before the boat leaves during our Checkin procedure. If you are under 18, contact us via ticket@oceanbeat.es and we will send you a legal document which needs to be signed by your parents so can be allowed to join us! Online tickets cannot be canceled. If for some reason you missed your boat party, we can reschedule it for another available date (30€ fee). Smoking on board is allowed. Please use the provided ashtrays. You will receive a ticket via e-mail. If you have not received a ticket, please check your spam folder. If you still cannot find it, please contact us here. It is very important that you take your ticket and a valid ID document with you. You should wear a relaxed summer outfit which enables you to go swimming. Unfortunately, we do not provide lockers and cannot take responsibility for your items. In addition, we kindly ask you to watch your valuables.